Pedestrians Left Cone Sign 600mm x 450mm. Class I reflective face and fully comply with B..
Pedestrians Right Cone Sign 600mm x 450mm. Class I reflective face and fully comply with .. Slow Cone Sign 1050mm x 450mm. Class I reflective face and fully comply with BS8442. M..
Ramp Cone Sign 1050mm x 450mm. Class I reflective face and fully comply with BS8442. M..
Road Closed Cone Sign 1050mm x 750mm. Class I reflective face and fully comply with BS844..
Road Ahead Closed Cone Sign 1050mm x 750mm. Class I reflective face and fully comply with.. Caution Raised Ironworks Cone Sign 1050mm x 750mm. Class I reflective face and fully comp.. 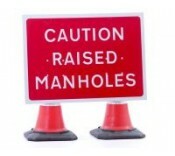 Temporary Road Surface Cone Sign 1050mm x 750mm. Class I reflective face and fully comply..
Traffic Control Ahead Cone Sign 1050mm x 750mm. Class I reflective face and fully comply .. When Red Light Shows Wait Here Cone Sign 1050mm x 750mm. Class I reflective face and full.. Diversion Left Cone Sign 1050mm x 750mm. Class I reflective face and fully comply with BS.. Diversion Right Cone Sign 1050mm x 750mm. Class I reflective face and fully comply with B.. Diversion Ahead Cone Sign 1050mm x 750mm. Class I reflective face and fully comply with BS8442..